I’ve been meaning to write a series of posts on the apple tree for quite a while, and here in the depths of winter, I have finally found time to do so! And while my timing is off season, I think it also gives us a look forward 8 months to a wonderful harvest in the year to come. Last year, I was introduced to the introduced me to the blessing and magic that is the apple tree. 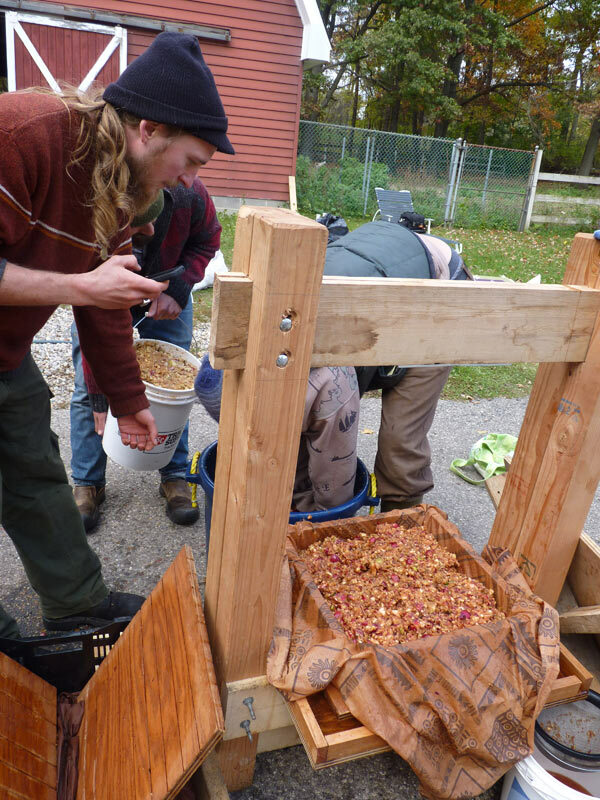 This process started with an Apple Wassailing in early January in 2013 (which we again did in 2014). But it wasn’t till later in the season, in early spring, that one of my friends really introduced me to the blessing and incredible nature of the apple. As my friend and I would be driving around or out on a foraging expedition, he’d point out the apple tree and say “Look, there’s an apple tree!” While I smiled and nodded, I didn’t quite understand his fascination with the apple tree early in the season. I enjoyed apples, I cooked with them, I ate them regularly, but I hadn’t spent much time communing with those trees. So while it was clear I didn’t have his level of reverence for the apple at that point, I was excited to learn more. South-Eastern Michigan through the summer months, I realized just how many apple trees there were, and I started noticing them in every yard, on every street corner, even all through my campus. As we watched the trees go from blossom stage (with their tasty blossoms and forage for bees) to fruit stage as the season went on, the magic of the apple tree continued to manifest. 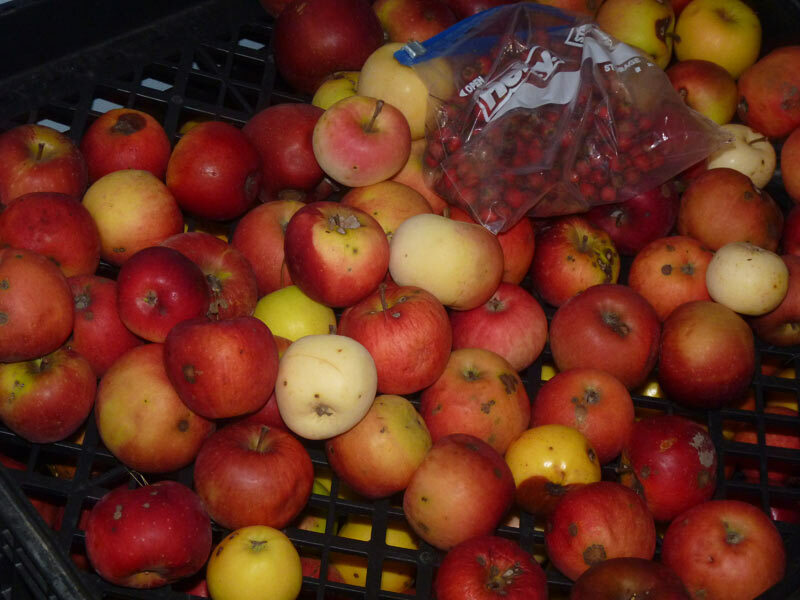 Apples were literally everywhere–their abundance ripening for the harvest! This past year, we had probably the most abundant harvest of apples that anyone I spoke to had ever seen–bushels and bushels and bushels of apples, so many that the trees were heavy laden with fruit (and in some cases, such as my neighbor’s home) succumbed to the pressure and cracked under the weight. 2013 was certainly the year of the apple! And so, when apple harvest began in September, we harvested. 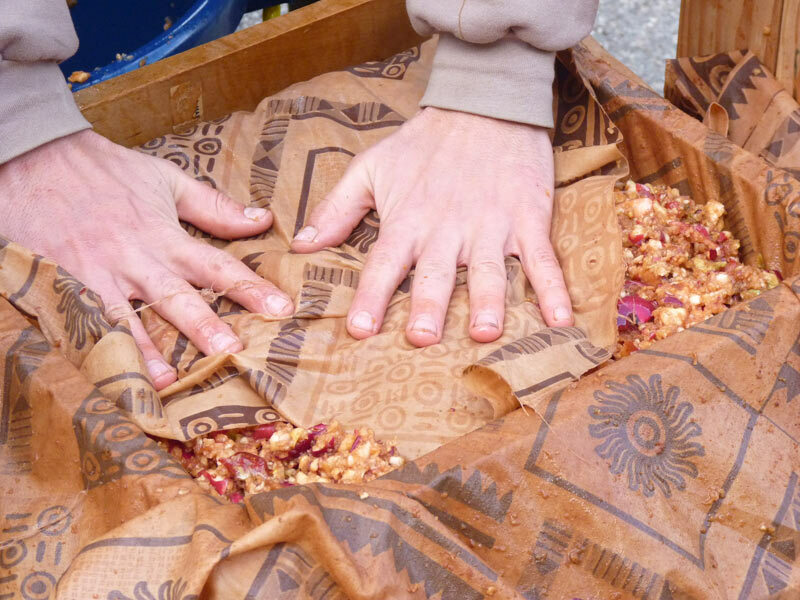 We harvested every chance we got–there were so many bags and bags and bags of apples! Apples of all kinds–crab apples, sweet apples, yellow apples, green apples, red apples, apples from my campus, apples from the neighbor’s house, apples from friends and families, apples from abandoned orchards deep on the edges of parks, apples in the middle of town….everywhere we went, apples were to be found! 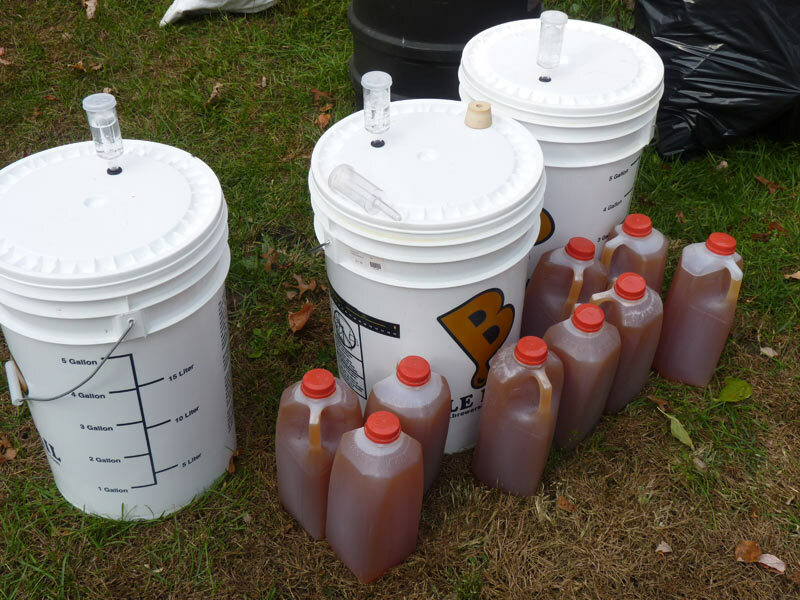 We harvested right up into November, even after frost when the apples went soft, they are still good for cider making. One of the things about harvesting apples, I learned, is that when the apple tree is ready, she gives her fruit freely. A simple tug will have the fruit falling right into your hand. If you tug, and tug, and the apple still is not coming off the branch, it means that the apple is not ripe and you may damage the branch by trying to harvest it. When you see apples starting to fall to the ground around the tree, you know the tree is ready to give her bounty. The second thing I learned about harvesting apples is that location of the fruit on the tree matters. 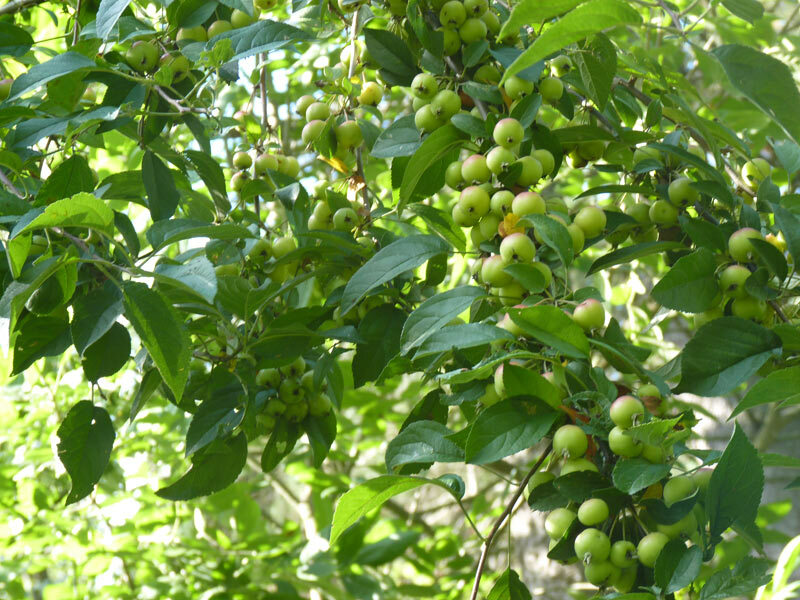 Fruit located in the south will ripen and be ready for harvest before fruit in the northern part of the tree (same with sunny/shady locations). The third thing I learned about harvesting apples is that different kinds of apples make different kinds of products–you can make a good fresh cider out of sweeter apple varieties–any variety with a high sugar content will do the job (crab apples work well for this, but require a lot more work because of their smaller size). A final thing I learned about harvesting apples is that cider apples don’t really have to be perfect–you can pick up ones on the ground, that have blemishes, and so on, because they will be pressed anyways! And then came…the pressing and the fermenting! I’m going to walk you through the stages of pressing with lots of photos. 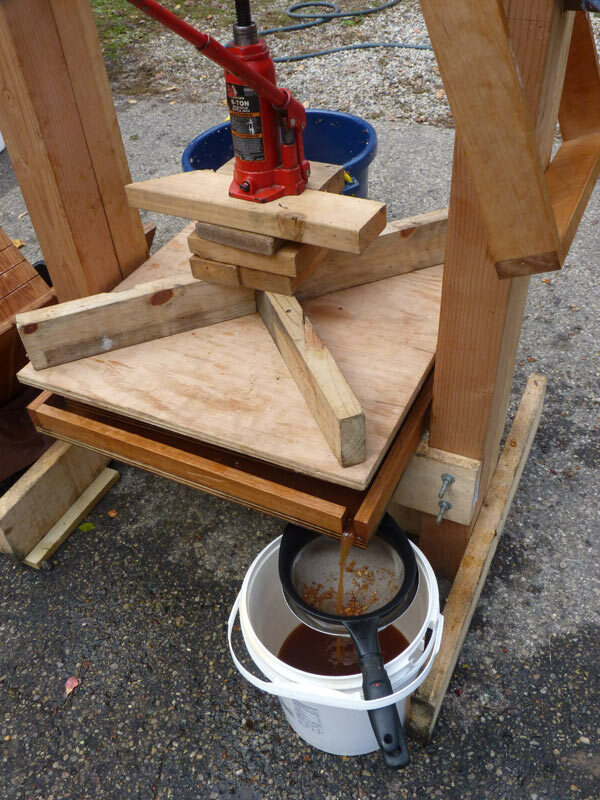 The press and apple grinder (scratter) were both handmade by my friends (commercial options are also available for those of you who want to press but don’t have the skill to build your own). 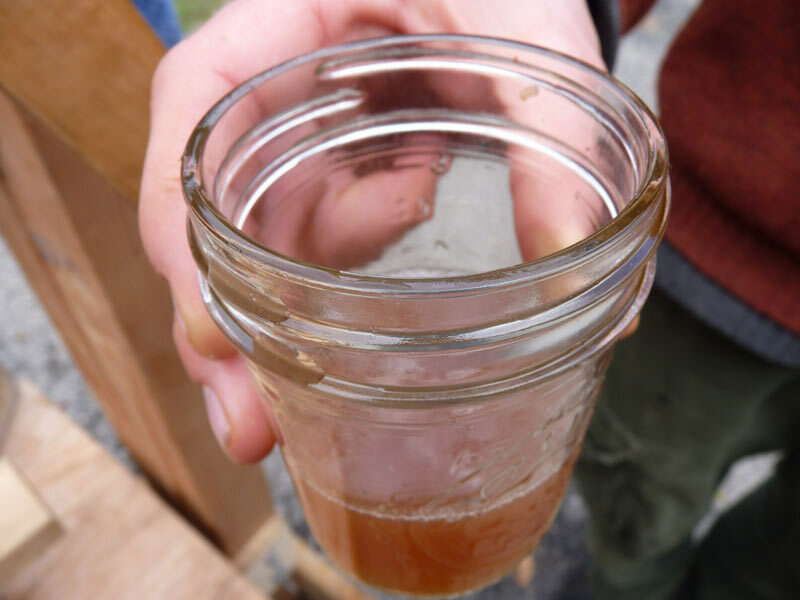 In order to effectively make fresh apple cider or plain apple cider (which refers to the hard stuff traditionally), you need a few things: 1) a lot of apples, which can very likely be procured for free; 2) a grinder to turn apples into pulp; 3) a press; and 4) some means of fermentation. Let’s start with the pressing process. The grinder chips up the apples into small pieces so that they will press better. Apples of any size or kind can be used (we also pressed some quinces that day). 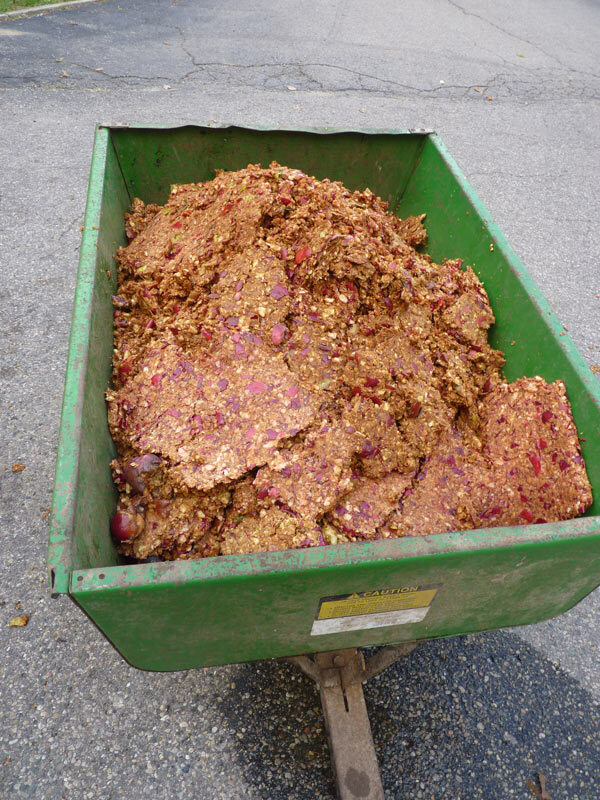 After the apples are ground, we add them to the press. The press works in layers–each layer of apples is added and then wrapped up in a cloth. (In previous times, these presses could be very large indeed, and instead of cloth, which was too valuable, people added layers of straw between each layer of apples). 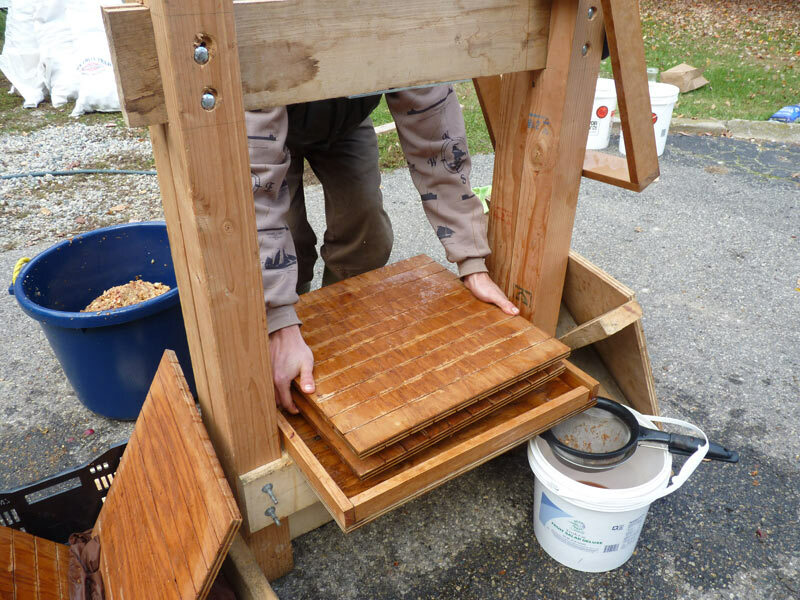 After each square of apple pulp and fabric (which holds the apples in the press), boards with groves are added. 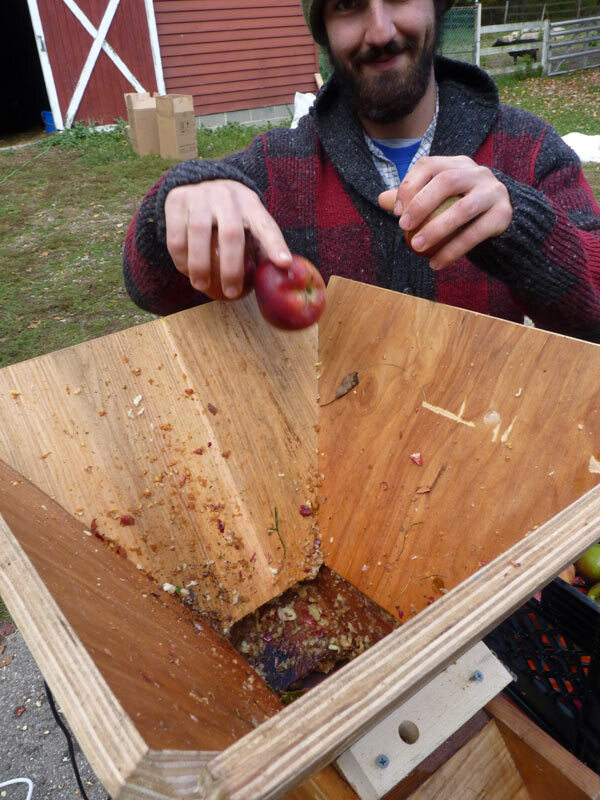 The groves allow the apple cider to run out into the bucket. 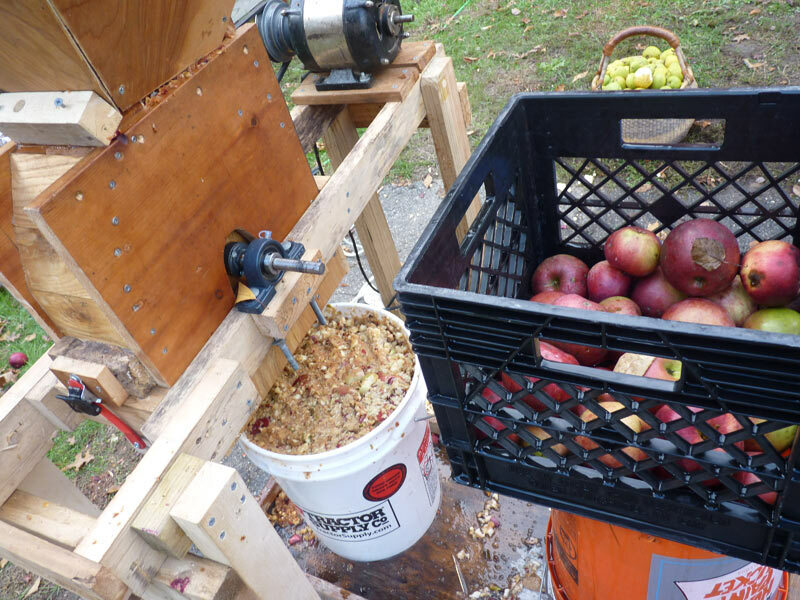 After the press is setup, you simply crank the jack and it slowly presses the liquid out of the apples. Since apples are up to 80% water, you can get a surprising amount of juice through this process! You can see that my friends strain the apple cider as it leaves the press–they are collecting it into a food-grade bucket. At this point, its customary to enjoy the fruits of your labor with a taste of the fresh cider. Some of pressed cider is frozen for enjoyment year round (I still have quite a bit in my freezer!) 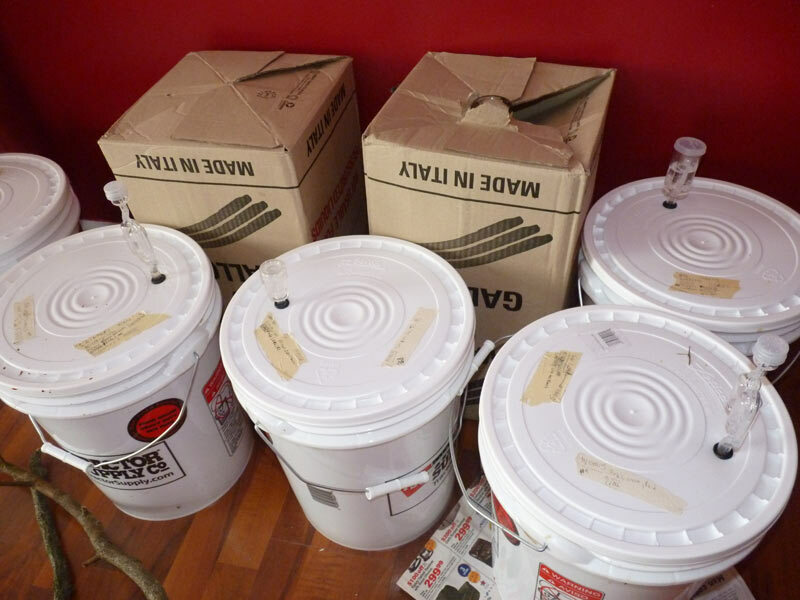 But the rest is put into carboys for fermentation into hard cider. 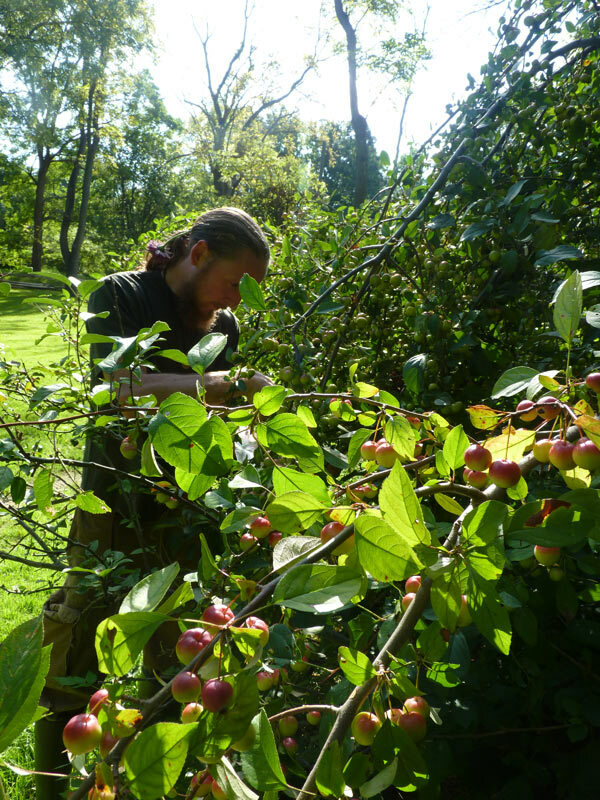 The pressings, after we are finished with them, are returned to an orchard and placed around the trees. This way, as many nutrients as possible are added back to the trees. I am still learning the fermentation process, so I’ll save that for another post when I understand it better and have more experience (I’ve only made dandelion wine so far!). 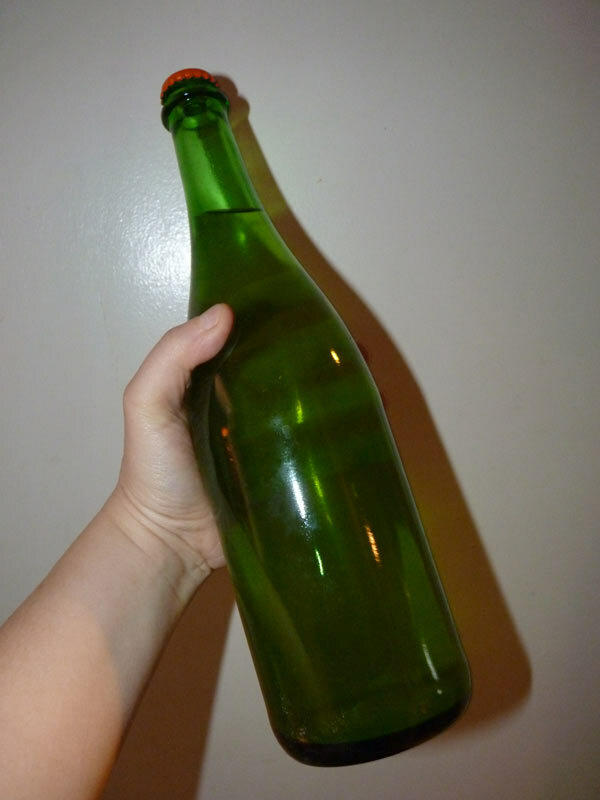 But I recently helped bottle up some of the finished cider, and I am storing more of it for my friend in my living room! I was honored this year to be introduced to the incredible nature of the apple tree–in Michigan, the apple is so abundant, so giving, so gentle. And the fruits can be turned into so many amazing foods–fresh eating, fresh cider, hard cider, cobblers, pies, applesauce, and so much more! I’d also like to acknowledge my friends for allowing me to take part in this process and for introducing me to the sacredness that is the apple tree. I think that the process of realizing how much the land–right outside our doorstep–has to offer us and how much free bounty is there for harvesting, we can’t truly appreciate the trees and the wisdom they offer. Without my experiences this year in seeing the apples go from dormancy (wassail) to flower to fruit and being part of the harvest, I wouldn’t have understood the apple as it changed through the growing season. Had I just bought apples from a farmer when they were ripe, I wouldn’t have had the opportunity to commune with the trees during harvest, to learn how to harvest from the tree, and to give back to them. I had grown up with apples nearby, but it wasn’t until this year that I was able to understand why the apple was such an important part of so many cultures, why it was such a sacred tree, and how it is one of the trees that can help us substantially make the shift back into a sustainable relationship with the lands around us. These opportunities represent learning experiences on many levels, and I am honored to have been able to have this experience. Wow! This was a great post! Maybe I will try pressing this year. I think I could get enough family and friends interested that we could all pool resources to get one (we aren’t that handy…..). I truly love apples! I was born and raised here and my family are farm people from Minnesota, so the food of the land is very special to us, and being born and raised in Michigan, apples have a truly special place in my heart. They are highly evocative and nostalgic, even, so this post was great to read and filled me with warm fuzzies. Yes, creating a community press is a wonderful idea! The first version my friends had of the scratter was actually a garbage disposal hooked up to a table. The new one is much better, but it is a much harder build (I don’t think I could build it at my current skill level). If you end up doing so, do let me know how it goes! Beautiful. Living in the great North of Minnesota, we have many, many apple trees. The intoxicating smell they give off in their groves is so very energizing. Puts a spring right back in your step if you are tired or worrisome. It is interesting how the different species of trees each give off their own scent that evokes so many different emotions. How I would love a taste of that cider. Warmed with a stick of cinnamon as it’s still so chilly up here. First, i will say that i love reading your blogs, and i like the blending of your practical earth path with the spiritual. I am a solitary Druid in South western Ontario, about half way up the shore of Lake Huron, across from the Thumb. 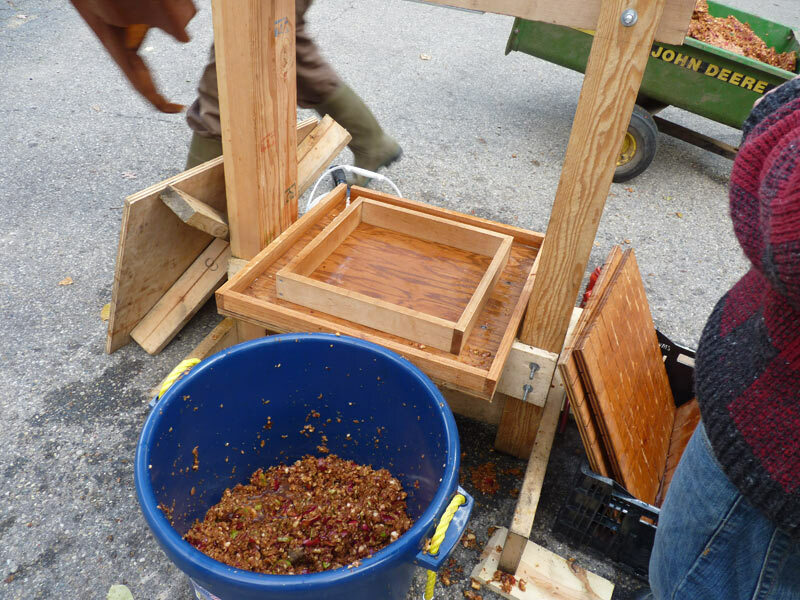 Do you have plans for the apple grinder and press. I refuse to buy the ,ready made inferior, throw away, mostly plastic versions. On another topic, i struggle every day with reducing my impact on our earth, in the existing consumerism, high carbon footprint which is today,s reality. I ruined my carbon footprint by flying to Ireland, but i spent a lot of time at Tara and New Grange. Spiritual growth in a setting not existing in north America. Thanks for your comment. The press and grinder are my friends’ and they use them every year! 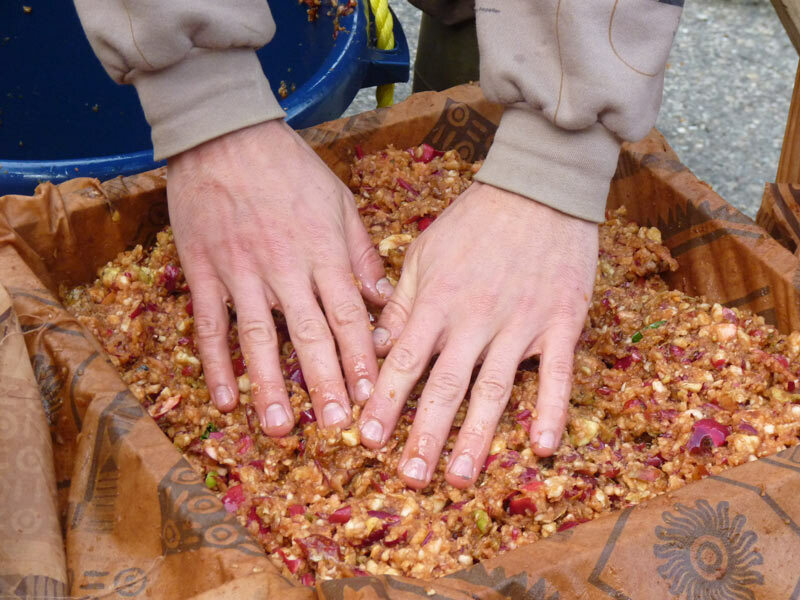 We are planning an apple celebration tied to our permaculture meetup this upcoming year (you should come! I am in SW Michigan, between Detroit and Flint. Would probably be a few hours for you). It sounds like you are engaging in the most sustainable farming practices that you can–I certainly support small family farms like yours! I think that *some* druids advocate a vegetarian diet, and some do not. One of the important things about druidry is finding, in the language of the AODA’s Gnostic Celtic Church program, one’s “personal awen.” One’s personal druidic path…..and for some, that might include vegetarianism, but for others, it might be localvorism as much as possible (I eat chocolate every day, and its not local, and well…I just can’t give it up!) Would love to hear more about your farm and your work with the earth path :). One more little blessing of apple trees–on the ground around old, dying apple trees in the spring, you may find morel mushrooms. You haven’t eaten mushrooms until you’ve had morels. In the Midwest you may have better luck around ash trees, but here in the East where morels are scarce, we often look in old apple orchards. So true, Karen! I’ve only found morel mushrooms in the deep woods…but I bet they are great from under the apples. Unfortunately, we have no large ash trees left–South Eastern Michigan is at the epicenter of the emerald ash borer blight. All of the elder ash trees have died off…some young ones remain, but not many. Its a terrible thing. I fear the day when the ash borer gets here. I keep hoping something in the ecosystem will start eating them and balance the population. Do you have elm trees? The most productive trees for morels are dying or recently dead elms. They can produce massive fruitings. But the ash trees (unfortunately) produce when they’re alive.